Facebook have now incorporated Microsoft's Live Search into the Facebook platform - both inside and outside the US. The Facebook search box can now be used to either 'Search Facebook' or 'Search The Web' and when searching the web, Live Search results are served directly onto the Facebook page. 'Search the Web' on Facebook showing Live Search results for "Nick Burcher"
I have previously written about the growth of social search (here and here), but the integration of Live Search into Facebook does not really count as social search - it's more 'search on social.' Currently Facebook are serving Live Search ads where appropriate or Facebook sponsored stories and display skyscrapers alongside the Web Search results. The query returns mirror the results on the Live Search site itself and users also have the chance to click through to 'Advanced Search on Live.com.' The Web Search results though are not influenced by a users Facebook activity or social graph. The launch of Live Search on Facebook will not revolutionise searching (yet), but in the short term it will give Microsoft greater search volumes. 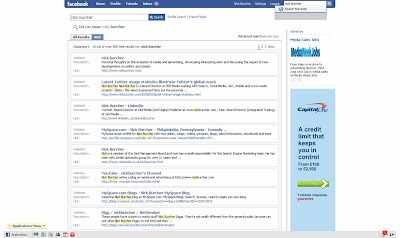 In time there may also an opportunity to leverage Facebook profile information to serve more personally relevant results and the integration of Live Search into Facebook clearly has the potential to develop social search functionality - I wonder how it will be before Live Search is specifically customised for Facebook?